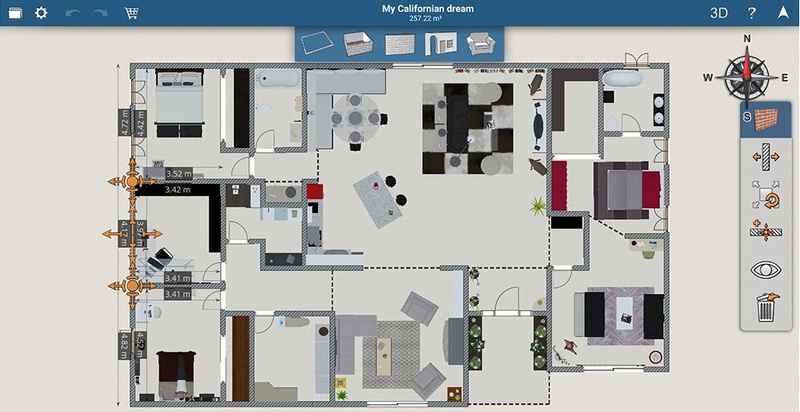 Home Design 3D Home design and decoration on iOS and Android is free. It allows you to design the dimensions of rooms and entrances in the house, and then decorate the decor in those places of your choice and your desire. It also allows you to save your design or share it with others. Initially, the design and formatting are done in a 2D interface, but after finishing you will be able to take a look at your design for the home and decorate it in a 3D style. The user interface is easy, all you need to add decoration is to pull the piece you want and put it where you want. There is also the possibility of adjustment on each piece as desired. Of course the free version is limited, and to get the full features you will have to buy from within the application.